There cannot be many young schoolboys or youths who have not craved to have the famous red painted Swiss army officers knife with all the gadgets that it boasted. We had had a tool to sharpen our pencils and of course a screwdriver when we needed one! Whenever as a small boy did we need one of those? There are of course many others that have many more functions and we have to say at a far lower cost than the Victorinox products, we are referring to one in particular, the True Utility Clip Tool, which we believe is practical and portable. This is a multi-tool which can be clipped onto just about anything that you wish to choose. This will be great for campers and caravan users to take away with them, on the tool you will find just about everything that you may need, powerful needle nose pliers, a knife, a bottle opener, a Phillips Screwdriver and features a quick release clip. It is not bulky either and it is lightweight, just 84mm long very practical and versatile! Made from high grade durable stainless steel; this is a useful tool that should be kept handy and if you do not want it on your key set, why not keep it in the house, car or office as a handy mobile tool kit, you are sure to find a use for it every day! 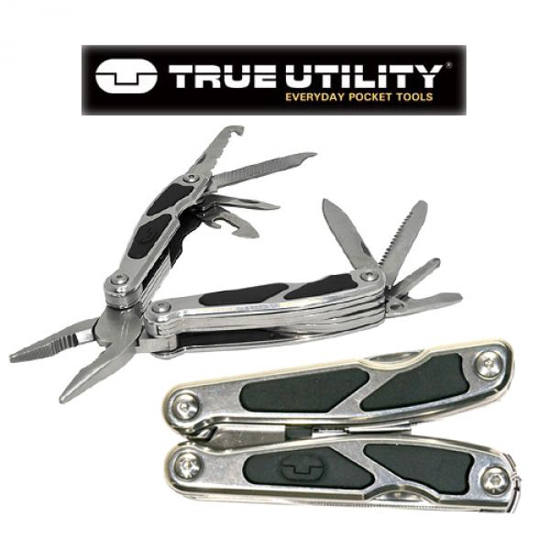 This is a great little multi-tool so if you are looking for a gift for Christmas for the outdoorsman, caravan user camper or hiker, this would make a nice little addition to their supply set. 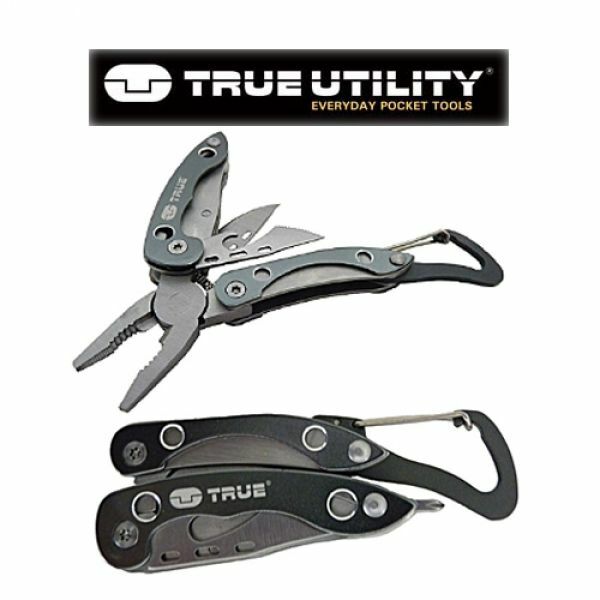 We all probably remember the Swiss Officer’s Knife first seen in 1897, but since then there have been others that have many more functions, such as the True Utility Framework, which we believe is quite possibly the most useful multi-tool ever made. The Utility Frame work is a very cleverly constructed multi-tool for your pocket or key-ring, hosting a range of possibly most of the essential tools that you may ever need in an emergency, or for everyday use. We suggest that it is something that should be kept handy, if not on your key ring then it can be kept in the house, car or office as a handy mobile tool kit, you are sure to find a use for it every day! This handy gadget holds a multitude of tools including pliers, wire cutters, knife, saw, file, bottle opener, can opener, screwdriver heads, both small and medium in size, Phillips screwdriver, and a small knife. 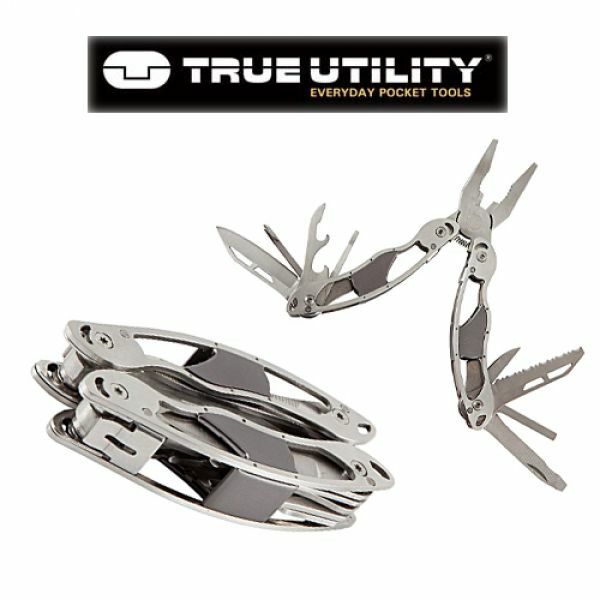 The True Utility Frame work is constructed with from stainless steel and anodised aluminium for strong function, coupled with an attractive design, it is a handy size at 108mm long and 50mm wide and it will fit perfectly in your hand, no man or woman should be without this beautifully designed multi tool. The RYOT Utility tool contains pretty much every tool the avid smoker needs whether it be poking, scooping, cutting or grinding. This lightweight tool is made from stainless steel and is guaranteed to provide a long and useful life. The utility tool features a range of dabbing tools, cutters, grinders and a bottle opener for when you want a cheek drink with your smoke. 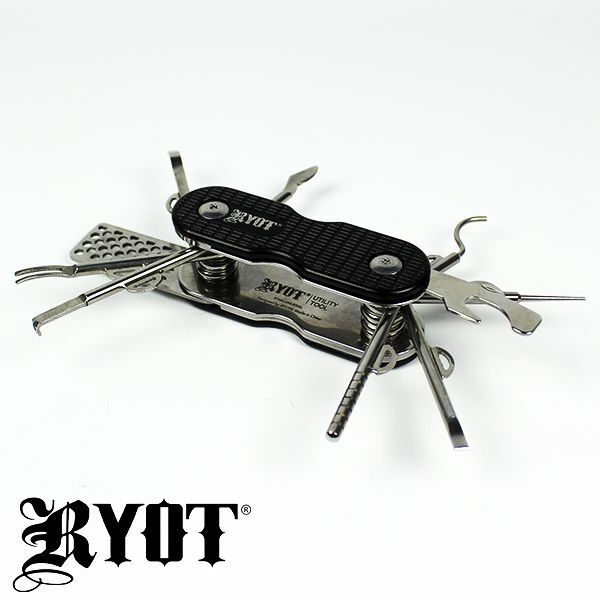 Compact and versatile, the RYOT Utility Tool really is the Swiss Army Knife of the smoking world. The utility tool also comes complete with a handy silicone case with a built in storage jar, perfect for when you’re on the move. The RYOT Utility tool is available now for just £49.99 and comes complete with a 1 year warranty against manufacturer defects. Even an ardent smoker will confess that the smell of stale smoke in the car or sitting room is not really very desirable even though it may be them that had caused it in the first place. Of course it is not only stale smoke that can cause smells in a home, we all cook at some time and even though we may have an extractor fan working, the smell can, and often does linger for some time afterwards. Pets also can be a source of odours, very often when the dog has come in from outside and is wet, you can be sure that they will smell. Well we have the answer to all of those and others too, for example if your best buddy lets one rip, you can eliminate the smell before you throw him out! With our can of Re-Fresh odor eliminator all you need is just two or three light sprays and you can quickly banish all unwanted smells. 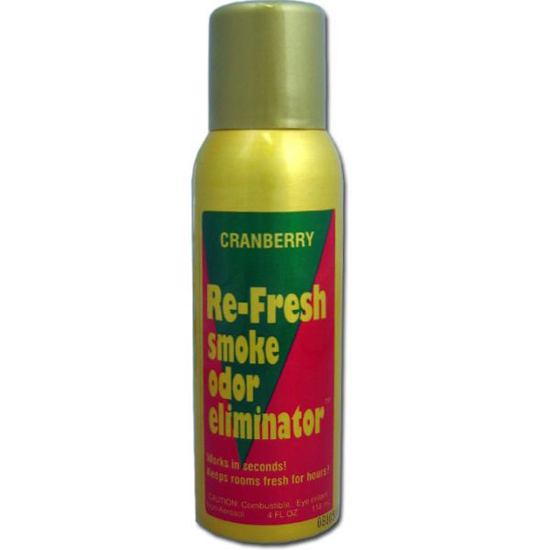 The Re-Fresh Smoke Odor Eliminator will soon clear your room of those smells in seconds with powerful scents and oil. We offer a variety of fragrances from which you can choose, these include Cranberry, Tropical, Green Apple, Spring Rain, Natural Citrus, Melon Magic, Pomegranate Punch, Crisp Cotton; if only we could buy underarm deodorants with those fragrances we would all be smelling sweetly. A word of warning here, do not attempt to use the Re-Fresh on the body, and we mean under no circumstances whatsoever, it is an air freshener only. The product is offered by us at a discounted 20% and is only £7.99 for a 118ml aerosol can. The True Utility MultiMate Mini – a great Valentines gift for a real man! No handyman should be without this wonderful tool, which can prove invaluable if you do not wish to carry a tool box about with you, this is a multi-tool in itself, but remarkably pocket sized. With an amazing thirteen useful tools in one tiny pocket sized piece, we believe that it is better than anything on the market at a comparable price; the True Utility MultiMate Mini combines functionality and design like never before. Made from the highest grade quality stainless steel it has black rubber grips which make it much easier to use. The True Utility MultiMate Mini folds down to a remarkable 75mm in length, a key ring attachment is provided so that it never gets left at home just when you need it, ideal for the home, car or work. The True Utility MultiMate Mini has needle nosed pliers with wire cutters which have been spring assisted for ease of operation, a flat head screwdriver, the essential bottle opener, file and nail cleaner with an awl for starting a screw, hook blade, can opener, eyeglass screwdriver, fine edged knife and serrated knife, in fact everything that you could possibly need for emergency repair work or everyday functions. Priced by us at just £21.99, this is one of many useful gadgets from True Utility, check out the other items at our web pages.